Here is my latest handmade slab pot. I can’t even say what glazes I used. Think I was half asleep and just grabbed a whole lot left over glazes and mixed them altogether. It is stoneware fired. 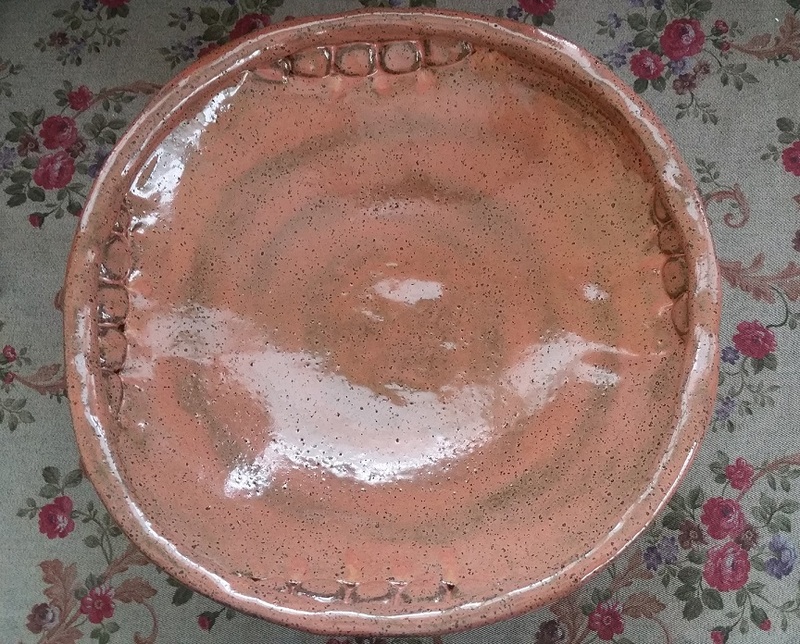 This entry was posted in Ceramics and tagged Ceramics, Handmade, Handmade plates, Homewares, Pottery, Slab Pots. Bookmark the permalink. ← My New Pot from Bison Ceramics! I like it. It looks shallow? Is that right or the angle of the image? The warm color is perfect for it, I think, however it came about! Hi Claudia. Thanks. It is quite shallow. Good for say a large fruit bowl etc. Hey your poetry marathon weeks are a great idea! Inspiring stuff!!! Thank you re: poetry marathons, it keeps me on track when otherwise I fear I’d be saying, once again…I MEANT to get to it, but…! As for your bowl, I was interested so much in the shape, it being slab built. Any clay I made is also handbuilt so I feel a kinship with your work from that standpoint, never mind how I also think it is so attractive! This bowl just had a nice personality to it, I thought. Glad you showed it!